Processing: Images were captured with Artemis Capture (as FITs). Aligned/stacked and dark subtracted in Astroart with Sigma Combine. IR / UV Blocking filter and Color channels were scaled and color balanced in Astroart. Channels were co-registered in Astroart. Luminance construction consisted of the IR/UV blocking filter exposures. Curves and Levels applied in Photoshop to the Luminance construction to optimize object features. Final LRGB combine was done in Photoshop using Luminance Layering. A light background noise reduction was applied to the image in PixInsight LE (SGBNR). Final Image size is approximately 1393 x 1044. All exposures in this image were guided; North is up in this image. This object is an open cluster in the constellation of Cassiopeia. It is involved with some dust and there is a background dark lane running top to bottom in this image. 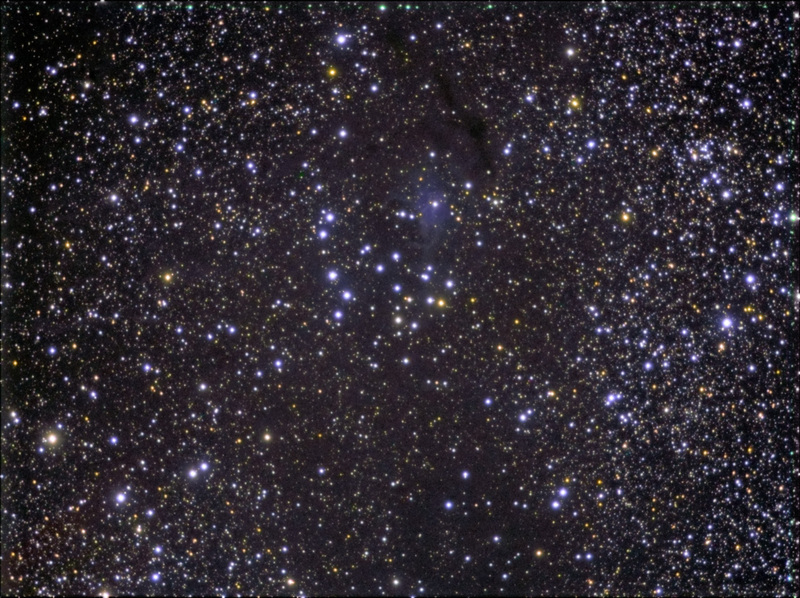 The blue reflection nebula above the cluster is cataloged as LBN 604. This cluster is also nicknamed the "Sailboat Cluster" NGC 225 is approximately 2,100 light years distant from Earth. The Horizontal FOV is 75'. Image center is located approximately - Equatorial 2000: RA: 00h 43m 56.7s Dec: +61°56'25"